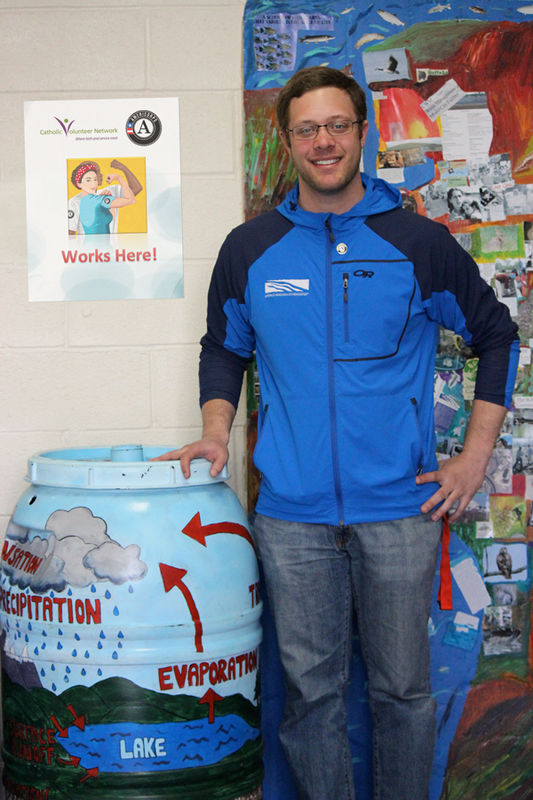 When Jarrett Steffen arrived at Buffalo Niagara Riverkeeper in the fall of 2013, he did not have a background in environmental studies, but he had a heart for service, a desire to learn and a natural talent for working with people. As a Buffalo native, he was familiar with the Buffalo and Niagara River ecosystems and how these waterways impacted the lives of the surrounding community. After studying philosophy at SUNY Buffalo and then beginning graduate school at Chicago Theological Union, his faith motivated him to take a break from his studies and get his hands dirty in service. Drawn back to his home state, Jarrett became an AmeriCorps member with Catholic Charities Service Corps. Jarrett’s service site, Buffalo Niagara Riverkeeper, is a “community-based organization dedicated to protecting the quality and quantity of water, while connecting people to water.” (http://bnriverkeeper.org/) Riverkeeper provides direct charity by acting as a voice for not only the natural ecosystems and all their inhabitants, but for the citizens who have the right to clean water and an accessible waterfront. As Community Outreach and Education Specialist, Jarrett is responsible for engaging, training and working with volunteers for shoreline cleanups, habitat restoration, removing invasive plant species and other volunteer events for Buffalo Niagara Riverkeeper. He also assists with the environmental justice program focusing on education and community outreach to impoverished communities that are disproportionately affected by multiple environmental harms and risks. Specifically, he focuses on educating refugee and immigrant communities, on the harms and risks of eating contaminated fish caught in local waterways. In addition to overseeing education programs, Jarrett is the leading force behind recruiting and mobilizing local volunteers for city-wide clean up events. This past Saturday, Riverkeeper hosted its annual Spring Clean Up, for which Jarrett coordinated over 1,500 volunteers at 41 different sites throughout the Buffalo Niagara region. Jarrett ensured that volunteers were trained in planting trees, maintaining gardens and removing invasive species. Approximately 20 tons of trash were removed and 80 new trees were planted! Afterward, Jarrett reflected, “I saw people become more connected to the environment and the people they were working with. It was a great event and I felt very accomplished for being able to coordinate something this big that had such an impact on our region. ” Buffalo, New York, is surely a safer and cleaner place to live because of the AmeriCorps service of Jarrett Steffen. Jarrett (far right) and a group of volunteers at the Spring Clean Up.